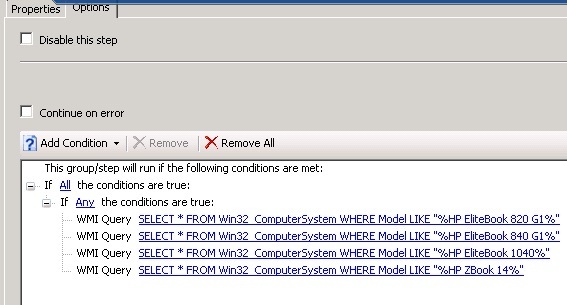 Strange goings on whilst working on a Task Sequence in SCCM 2007. One of the driver packages wasn’t applying to the end device. The WMI query checked out ok but the device booted up without any of the drivers applied. Checking the SMSTS.log I noticed that the driver package step was marked as disabled. However looking at the Task Sequence the step wasn’t disabled. To remedy the problem, I disabled the step, applied the change, removed the check mark from the ‘Disable this step’ checkbox and then clicked ok.
On my next build the step was no longer marked as disabled and the driver package applied.